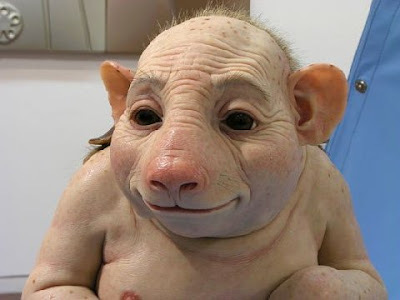 Kim Unplugged: Randomness: Does Swine Flu Look Like This? Swine flu is a respiratory disease, caused by a strain of the influenza type A virus known as H1N1. Although the strain may have originated in pigs, it is now a wholly human disease. It can be spread from person to person by coughing and sneezing. A fever - which is a temperature of 38ºC (100.4ºF) - is the key symptom, combined with other complaints which may include a cough, sore throat, body aches, chills and aching limbs. Some people with the virus have also reported nausea and diarrhoea. As with normal flu, the severity of symptoms will depend on treatment and the individual. Many people have only suffered mildly and have begun to recover within a week. People are most infectious soon after they develop symptoms, but they cease to be a risk once those symptoms have disappeared. The incubation period may be as little as two days. The service allows sufferers to get access to anti-flu drugs without the need to consult a GP. However, those with underlying health conditions, the under ones and pregnant women are still being advised to contact a doctor. The GP route is also open to anyone who does not want to use the service. In the initial phase of the outbreak, lab testing was done to diagnose the flu but this is no longer happening routinely. So what's the real deal? Should Londoners be worried? Health officials say that if you're pregnant or have underlying health conditions, it's in your best interest to learn more about the virus so that you can take all necessary precautions. I don't know about you, but I find myself leaning further away from the person coughing up a storm on the tube and stocking up on antibacterial products when I visit Boots!